The upcoming Vietnam Business Summit (VBS) will be held as part of the World Economic Forum (WEF) this year. It will bring together 1,200 foreign and Vietnamese businesses on September 13. The summit, hosted on the last day of the World Economic Forum (WEF) ASEAN 2018 in Hanoi, will be an opportunity for local and international firms to share experiences and spot opportunities to invest in the country. Hosted by the Vietnam Chamber of Commerce and Industry (VCCI), the event will have Prime Minister Nguyen Xuan Phuc and WEF President Borge Brende as two main speakers. Organizers said meeting delegates will be able to see where Vietnam is in the global value chain and how the country can become a connection and innovation hub. “We have already had a successful VBS last year at the APEC Summit, so we expect that this year’s event will also be a marketplace for global businesses to see investment opportunities in Vietnam,” said Vu Tien Loc, VCCI Chairman. APEC, for Asia-Pacific Economic Cooperation, is a forum for 21 Pacific Rim member economies that promotes free trade throughout the region. As multinational companies leave China for new markets because of the trade war, Vietnam will be one of the first options to be the exporter several products, Loc said. Therefore VBS will be an ideal opportunity for local businesses to meet with international counterparts and work to make Vietnam “a central point of connection and innovation in the world,” he added. This will be the first time that the VBS is organized as part of the WEF, which is an annual forum for business and political leaders to share their ideas on how to improve the state of the world. 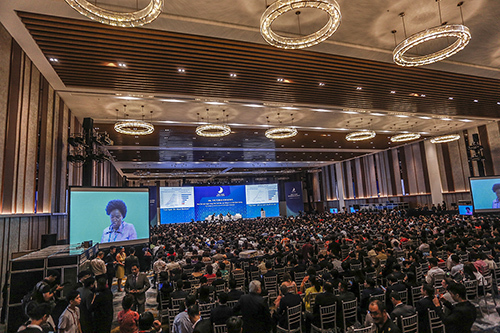 WEF ASEAN will be held in Hanoi from September 11-13, attracting 900 leaders and business representatives from the region. This is the second time this event takes place in Vietnam.